Owning an automatic knife or switchblade is a big responsibility, whether you’re looking to add a new knife to your collection or need a heavy-duty survivalist tool. In our guide, we have looked at many different styles of knife, to give you a broad view of the market, and the different styles available. Our list of the top seven knifes covers some of the best options on the market, while our FAQ section will walk you through some of the essential parts of knife ownership, such as the difference between automatic knife releases, blade steels, and the importance of automatic knife laws. The SWMP4LS 8.6in Stainless Steel Assisted Opening Knife, designed by Smith & Wesson, is a well-constructed knife, designed in all black. The blade is made from a strong and highly durable 4034 Black Oxide S.S, with a partially serrated lower edge for multi-purpose use. This is combined with a handle constructed from aluminum and an additional rubber inlay for safe and secure use. The sleek design features a glass breaker at the end of the knife handle and thumb plate, so you are always prepared. The security of the knife is further enhanced with a liner and safety lock, for added non-slip safety. The blade is simple to release with the help of M.A.G.I.C assisted opening, and the finger actuator. For a strong, durable, and good all-round knife, the SWMP4LS 8.6in Stainless Steel Assisted Opening Knife is an excellent choice. 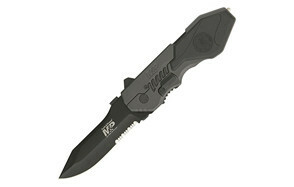 Make sure you also check out our list of the top tactical knives for more great items like this. Designed by Benchmade, the 3300 Infidel OTF Knife is a very interesting automatic knife, offering many outstanding features and excellent mechanisms for easy and safe use. Well-designed for tactical use, the knife is classed as a double-action OTF automatic. 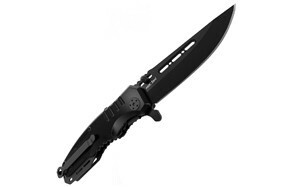 The 3300 Infidel OTF Knife is primarily designed for right-handed users, with an all-black handle, bar the release catch which is highlighted in grey. 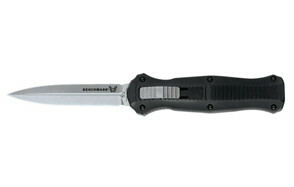 Constructed from D2 steel, the blade is double edged with a spear-point, while the handle is made from sturdy aluminum. The automatic knife is easily released via the sliding mechanism on the handle face. The handle itself is designed to be comfortable to hold, and non-slip for safety, thanks to the unique and easy to grip ‘stepped’ style. The addition of the pocket clip also makes the knife simply to carry and easy to attach. Constructed from 440C stainless steel, the Spring Assisted Knife by Grand Way is one of the most affordable options available on our list. The classic design is incredibly sleek, with the handle and blade both colored in black with the addition of a monostatic clip for easy storage. Whilst sleek and simplistic, the knife is rust-resilient, durable, and stays sharp for long periods of time. Designed to be comfortable to handle, the Spring Assisted Knife offers a convenient reverse and direct grip, and a handle made from aluminum that is aircraft-grade. This strong design is secured with a liner lock which is highly resilient to contamination from dirt. For added safety during storage, the knife also comes with a mechanical fuse, so it can’t open accidently. For a simple, but highly practical knife for survival, this offering from Grand Way is a good and reliable pick. The Casbah Drop Point Fine Edge Knife by Benchmade is very simplistic in design, but offers everything you would need in a handy, easy to use, survival knife. The push button mechanism means that the blade can be released quickly in emergency situations, while the small 3.4” blade is practical and sharp. The blade is made from steel and coated with a drop point edge. While the design may be very minimalist, when compared to similar knifes on the market, the textured grivory handle makes the knife easy to use and provides added security when handling. The handle is colored black, with the release button easily accessible. A classic choice of knife from Benchmade that’s ideal for a multitude of purposes. 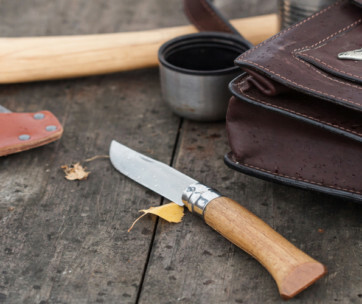 Our handy list of bushcraft knives features more great products like this. This highly decorative knife would make a great statement addition to any knife collection, but also boasts exceptional practicality for survival use and defense. Designed at created by Schrade, the most noticeable feature of the Viper 3 is the uniquely designed handle, which provides a much more intricate design that many similar double spear-point automatic knives on the market. As well as an enhanced design, the Viper 3 also comes with many popular features, including a window breaker tip and essential safety locking mechanism. The stainless-steel blade and aluminum handle are strong, with the blade being easily released via the mechanism on the side of the handle. For convenience, the Viper 3 by Schrade also comes with a pocket clip for deep carrying. This is a top choice for a knife that performs well, but also looks interesting with an appealing handle design. If you are a knife lover, make sure you check our pocket knives guide as well. The SCHOTF3CB Viper 3rd Gen OTF Assist, is another knife designed by Schade, but that features a much more intricate style of blade when compared to the Viper 3. The handle is very similar in design to the Viper, featuring classic Schade engravings, and the Schade brand engraved in the middle. What really makes this knife standout however, is the recurve blade design on the double edge spear point blade, colored in black to match the handle. Combined with the unusual handle design, the knife would make a great addition to any knife collection, but also offers practicality in a different way to the similarly designed Viper 3. The recurve design is similar in practicality to larger serration, with the hard aluminum handle providing plenty of security and grip. This is further enhanced by a locking mechanism, which secures the front opener at the side of the knife, used to release the blade. 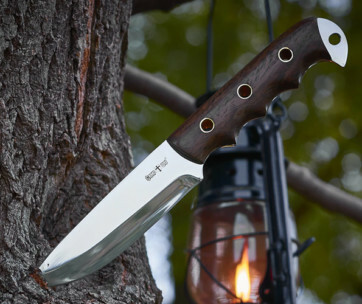 Find more great knifes like this by checking out our hunting knives revirew. Gerber is well-known for their high-quality knives and survival tools, making them a popular brand for innovative and functional knives. 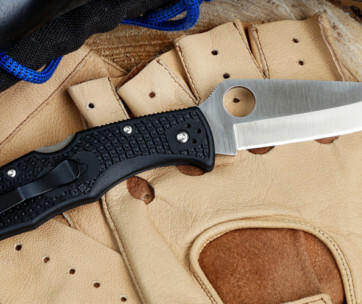 The Mini Covert Fast Knife from Gerber is compact, serrated for multi-purpose use, and well-designed; a highly practical knife that is well-suited to a vast range of purposes. Much smaller than many knives of a similar style, the Gerber Mini Covert Fast Knife is very quick to release, with F.A.S.T opening technology used to assist the release of the blade. The forward action opening means that the knife can be opened using only one hand, in difficult situations. The design of the knife is sleek, and all black. Unlike many knifes, the blade of the Mini Covert Fast Knife is made from stainless steel but coated in titanium 7Cr17Mov for improved resistance against corrosion. With an emphasis on security, the G-10 handle boasts a secure all-condition grip. If you’re looking for a small and lightweight knife, with a serrated edge, the Mini Covert Fast Knife, is a well-suited choice. Perhaps the most important part of owning an automatic knife is understanding the laws surrounding the ownership, use, and concealment of a knife in the USA. In many areas of America, it is illegal to carry a knife or open one, partially due to the speed at which an automatic knife can be opened. Carrying a concealed knife illegally can be classed as a felony or a misdemeanor, depending on which state you’re in. Before considering purchasing a knife, it is essential to read the laws in your state and understand fully whether or not you are allowed to own an automatic knife, or any kind of knife. Each state has different rules and exceptions, that determine the regulations surrounding knife use. Some states allow for the use of knives during certain activities, like in the instance of fishing and hunting, while other states have stricter policies. There is also a lot of variation between the definition of ‘concealed’, and varying regulations surrounding prohibitions over knife use in certain areas, like around government buildings and schools, along with differing prohibitions over who can, and who can’t, own a knife. Hidden Release – This type of release varies in style between knives, but can be extremely beneficial, as only you will know how to open the knife. AXIS Pull Release – A slightly less common release, a pull release knife will have a handle stud locking mechanism on both sides of the knife. Lever – These can be very easy to open, with a quick pull of the level being all that is needed. Firing Button – An extremely common mechanism, firing button release knifes feature a singular button from which the knife can be released. When purchasing any kind of knife, and especially automatic knifes, you need to make sure that you’re getting a style and design that is right for your purpose, is strong, and resistant to wear. A lot about the quality and practicality of an automatic knife can be determined by the choice of blade steel that has been used. Ideal blades will be tough, easy to sharpen, resistant to stains, retain their edges, and be resistant to general wear and tear. There are multiple steel types to choose from, with AUS-8, 400 Series, D2, Damascus, and CPM-S30V, being amongst the most popular. It is important to note that many types of steel blades can vary in quality considerably, despite being stated as the same thing. This is especially the case with 400 Series steel, which ranges from, soft, to extremely resistant against wear. From the classical Damascus steel, to the resistant D2 steel, it is essential to do your homework on the quality of the knife you’re considering buying, before making a purchase. There is often a lot of confusion about the difference between an automatic knife and a switchblade, but the two terms generally mean the same thing in terms of knife construction. Often, the two terms can be used interchangeably, when taking about knives that open automatically. The reason behind the popular adoption of the term ‘automatic knife’ over ‘switchblade’ is partially due to the law passed in 1958, the Switchblade Knife Act, which prohibits the carrying of a switchblades and interstate importation and purchase.